Results from the Human Genome Project revealed that the human genome contains approximately 20,000 genes. A gene contains (encodes) the information that each cell uses to make (express) a protein, which is essential for the body to function properly. Abnormal protein expression is associated with many human diseases, which makes proteins key targets for therapeutic agents. Approximately 3,000 genes are considered part of the “druggable genome,” a set of genes encoding proteins that scientists can or predict they can modulate using experimental small molecule compounds. Yet the existing clinical pharmacopeia is represented by only a few hundred targets, leaving a huge swath of biology that remains unexploited. Therefore, a large number of proteins remain for scientists to explore as potential therapeutic targets. Much of the druggable genome encodes three key protein families: non-olfactory G-protein-coupled receptors (GPCRs), ion channels and protein kinases. Researchers lack crucial knowledge about the function of many proteins from these families and their roles in health and disease. Better understanding of how these proteins work could shed light on new avenues of investigation for basic science and therapeutic discovery. To improve scientific understanding of the four understudied protein families, NIH launched an effort called Illuminating the Druggable Genome (IDG) in 2013, with the first awards made in 2014. The IDG was originally funded as a three-year pilot program sponsored by the NIH Common Fund and designed to create a centralized information repository and develop new technology platforms to study the protein families. Now, the current implementation phase of the IDG Program aims to build on the knowledge and tools developed during the pilot phase and disseminate these IDG-generated resources to the greater scientific community. NCATS Director Christopher P. Austin, M.D., co-chairs NIH’s IDG Working Group with Griffin P. Rodgers, M.D., M.A.C.P., director of the National Institute of Diabetes and Digestive and Kidney Diseases. The group includes representatives from the National Institute of Mental Health, the National Cancer Institute, the National Institute of Neurological Disorders and Stroke, and other Institutes and offices at NIH. By expanding the potential therapeutic space through the IDG program, NIH is clearing a path for more efficient disease-related research and more effective treatments for patients. For more information about IDG, visit the NIH Common Fund website. The Knowledge Management Center (RFA-RM-16-024), which organizes and shares data and metadata produced by the IDG program, including resources collected during the pilot phase of the program. The scientific community may access these data through Pharos. Data and Resource Generation Centers (RFA-RM-16-026), which use scalable technology platforms to characterize functions of understudied GPCRs, protein kinases and ion channels at the molecular and cellular levels. The Resource Dissemination and Outreach Center (RFA-RM-16-025), which provides the administrative structure for the IDG program, working with all IDG Consortium investigators to collect, curate and disseminate information regarding critical tools and reagents being developed by the IDG Consortium. NCATS plays a crucial role in the IDG program by administering the Resource Dissemination and Outreach Center award and through co-coordination of the overall program with the National Institute of Diabetes and Digestive and Kidney Diseases. View funded awards for the IDG program. Investigators from the Illuminating the Druggable Genome program recently discovered that about one in every three proteins is poorly understood. 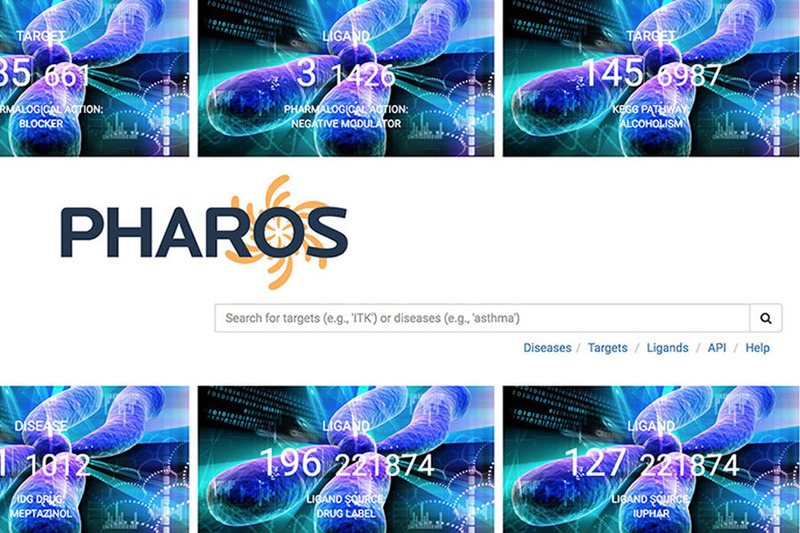 To speed new research along, NCATS scientists have developed an online protein information portal called Pharos.